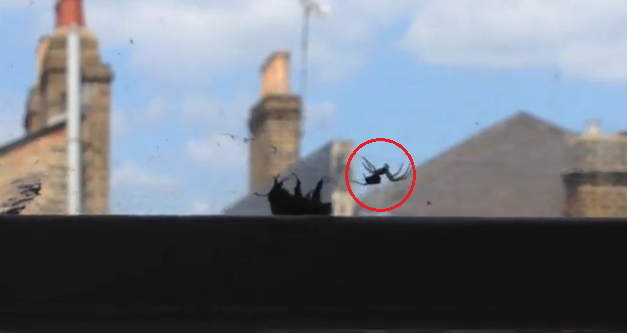 A few weeks ago, a video of two bumblebees and a spider went viral. As of this writing, it has surpassed two million views on YouTube. It shows a bumblebee trapped in a spider's web. Out of nowhere, another bumblebee appeared and seemingly rescued the distressed one by stinging the spider. Well, a bumblebee expert has stepped up to the plate to explain what actually happened. In an article published on The Conversation, Professor of Biology Dave Goulson explained that although bumblebees are among the intellectual giants of the insect world, "action heroes, they are not". According to Goulson, when bumblebees are in their nest, they will attack and try to repel invaders but "they would never come to the aid of another bee away from the nest". As to the part in the video wherein the second bumblebee seems to sting the spider, Goulson has the following to say: "In fact, what one can see is the rear leg of the bee which happens to line up with the tip of the abdomen for a moment. It is too long and thick for a bee sting."